Ah, time for my ‘look what Tereza got me from the Czech Republic’ beauty blog post. Last year she got me a nice little selection of goods including a beer shampoo and lip balm, which was interesting. This year she asked me what I would like before she ‘put the order in’ (from her mum) and there was so much to choose from I just couldn’t…. So this is what I ended up with…. 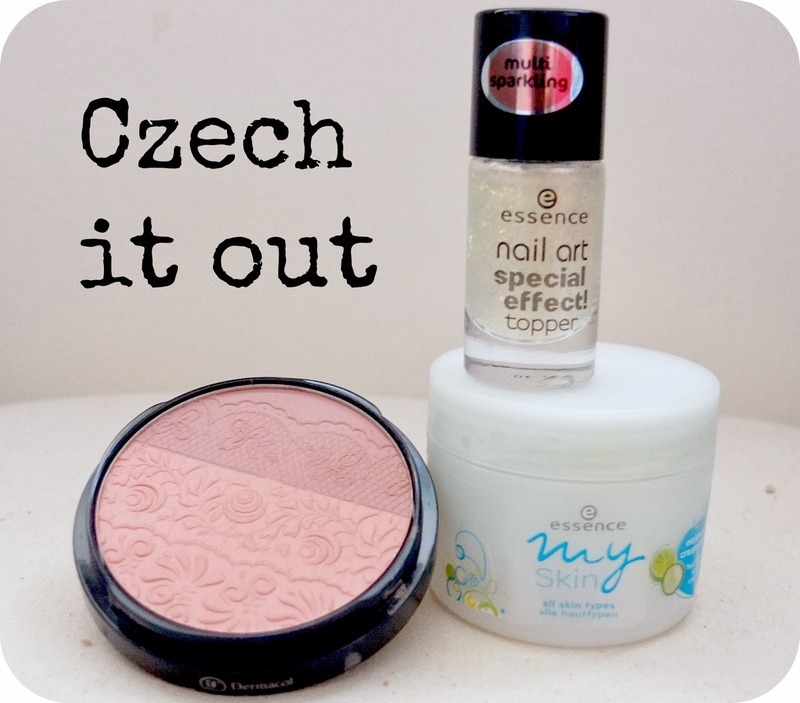 Beauty blog treats from the Czech Republic! I know essence have been hot topic around the beauty world for a few months or so, and their availability in the UK is somewhat sparse. I keep seeing them around social media but can’t for the life of me find an online store based in the UK to buy anything from! If you’re not familiar with essence then from what I gather they’re just Europe’s equivalent of a brand like Collection 2000 – affordable and alright quality with some fancy pants lines. I am now the proud owner of the essence nail art special effect topper, which is a lovely lustre glitter kinda thing which looks so different depending on which nail varnish you use as a base. For Halloween it was great as over black the glitter shimmered orange! Over lighter colours it’s a more frosty winter feel to it. The essence my skin moisturising gel cream is another essence product which I’m very impressed by. It’s not the most hydrating of moisturisers but it doesn’t break me out in spots and feels really refreshing! It is also a really nice base for make up, as I do find it hard to find a day time moisturiser that works under my foundation and this soaks in really quickly and wakes my skin up a little in the morning. The dermacol duo blush is the most fancy pants lace imprint design and looks so beautiful I don’t want to use it! But the powder is set and quite ‘hard’ if that makes sense?! This has been pictured after a week or so of use every day and is still super pretty. I’d never heard of dermacol before but I really want to ‘czech’ out more (see what I did there? Because they’re a Czech brand? NO? I’m wasted on you guys). Have you tried essence or dermacol before? What are you favourite products from these brands?